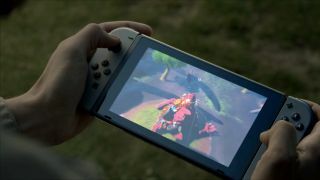 Nintendo Switch has a phablet-worthy screen for displaying games on the go, but Nintendo won't say whether it's touch sensitive. The company has been super into touchscreens ever since it debuted Nintendo DS in 2004 - Wii has been the only console it's made without one since then - but it sounds like we'll have to wait to find out whether its touch infatuation is finally at an end. "We have nothing to announce on this topic," a Nintendo of America representative told Eurogamer. "We will make additional announcements about the Nintendo Switch hardware later, before the launch of the product". The Nintendo Switch debut trailer showed off a number of potential controller options but at no point did any of the trendy 20-somethings lay a finger (or a stylus) on the system's screen. Granted, Nintendo might have deliberately held back on presenting that feature to focus solely on one central message: Switch can play home-console-quality games wherever you want. We've gotten so accustomed to touchscreen support on all of our mobile devices that it might be weird for Nintendo to leave it out. But the screen is inaccessible when Switch is plugged into its TV dock. And adding touch sensitivity would be an extra cost for a console that's already packed with custom technology and accessories. From the user's perspective, it looks like your fingers would be too far from Switch's screen in handheld mode to interact with it comfortably, and the whole kit is big enough that it would be awkward to support in one hand. Nintendo could still show something to change my mind, but for now I'd rather the company just leave off the touchscreen than bump up the price or weight of Switch.